Sri E.K. Divakaran Potti, a prominent personality in Malayalam Translation literature born on 28th April, 1918 at Puthenchira an adjacent Village of Mala in Thrissur District. He is a member in Edamana Illam at Puthenchira. E.K. 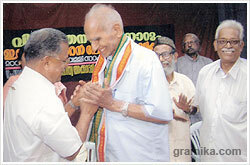 Divakaran Potti was a high school teacher by profession from 1950 to 1973 in the Kizhakkambalam High School. He has died on 23rd July 2005 at his 87th years. E.K. Divakaran Potti is mainly known for his valuable contribution in the field of translation literature. In 1939, he has published his first kavitha samaharam (A Collection of Malayalam Poems and Poetry from Famous Poets) "Prathamanjali". He has translated into chaste Malayalam, all the major works of Munshi Premchand including "Godaanam", "Rangabhoomi", "Nirmala", "Premasramam", "Karmabhoomi", and "Vanchana". His major works include "Prathamaanjali", "Naalathe Prabhaatham", "Vijaya Rangam", "Balipeetathil", "Godaan", "Premapanchami", etc. Godan, Premchand’s last completed novel is considered his best work has been translated to Malayalam by Shri E.K. Divakaran Potti. It is the most realistic interpretation of Indian village society, the backbone of India. It is a story of changing people, hungry and semi-starved, yet hopeful and optimistic, in the truest spirit of the age it represents. Shri Potti has preserved all the essence of Godaan origin while translated into Malayalam. Some of the famous translations of Sri E.K. Divakaran Potti are "Party Comrade" by Yashpal, "Volga muthal Ganga vare" (From Volga to Ganga) by Rahul Samskrthyayan, "Kazhumaram" by Victor Yugo and "Kolamarathilninnulla Kurippukal" by Julious Fuchik and some of the books of famous writers like Targenev, Khaleel Gibral, William Lamness, Hallcain. The total number of books he translated into Malayalam will be about 30 including three Kavithasamaharam, two dramas, and one Hindi-Malayalam dictionary. His kavithasamaharam "Ariyittuvazhcha", had been banned by Kochi Govt. in 1948. No wonder he has won the Sahithya Academy award from translation. He passed BA and B.Ed examinations and also Malayalam Vidwan and Rashtrabhasha Praveen. He was the younger brother of Professor E. K. Narayanan Potti. He was a freedom fighter, an active worker in the Congress party and subsequently in the Communist Party of India. He was arrested in 1948 and jailed 6 months in connection with the Aikya Kerala Prakshobham. E.K. 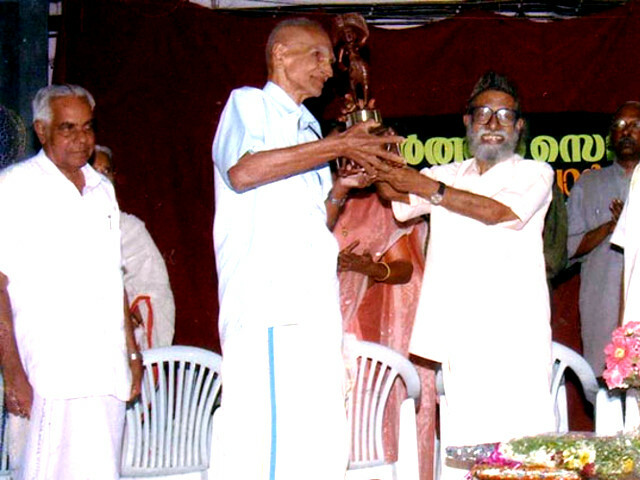 Divakaran Potty has been honored by many awards including national level awards. Kerala Sahithya Academy Award, National award from Kendra Sahithya Academy, Devikrishna Award, Aadarsha Hindi sevi award, Hindi Sevi sammaan, M.N. Sathyarthi Award, C. Achuthamenon Award etc. E.K. Divakaran Potty is the founder of Grameena Vayanasala at Puthenchira. In order to remember his valuable contributions to Malayalam Literature, Puthenchira Grameena Vayanasala arranged an award for best Malayalam Translation Literature which will be given in every year. ©2019 Mala.co.in. All Rights Reserved.